« Where do I start…. So do you think it’d be better to change them to Daedric so that they match better with the later games? It’d be pretty easy, I’d just look up the font select ones that seem to fit the “on a wall of the dungeon” motif. No, I wouldn’t try to give Arena what it wasn’t meant to have. 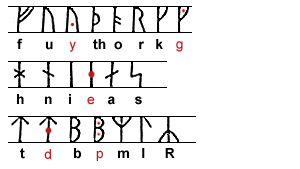 The Deadric theme wasn’t developed (enough) by that time and I don’t know in what context these runes appear in the game. If it’s for example dungeons in Skyrim, it would fit pretty well (even though, I don’t think it is even remotely part of the later lore, since Nords used Cuneiform, not runes). So, I suggest letting them stand there as memorial to The Elder Scrolls’ early history and accepting them as symbols of obscure meaning in the game universe.